Did you know there are 4 types of goals in Google Analytics designed to help you make improvements to your website and help your business grow? Knowing how your site is performing, and how site visitors behave once they arrive, is the only way you are going to be able to tell how your business is doing. 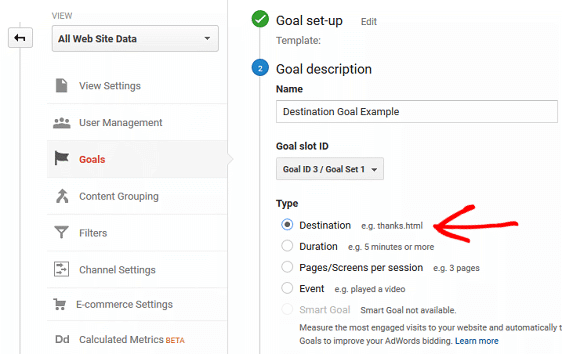 In this article, we’ll go over the 4 types of goals in Google Analytics and how to set them up so you can start tracking the right kind of data for your business. Goals in Google Analytics allow you to track specific visitor interactions on your website. For example, you can track things like form submissions, button clicks, account creations, and eBook downloads. Then, once a visitor performs the specific action you’ve defined as a goal, Google Analytics records that as a conversion. But the thing is, unless you tell Google Analytics to track this information, you’ll never be able to see this data. That’s where creating goals in Google Analytics is helpful. 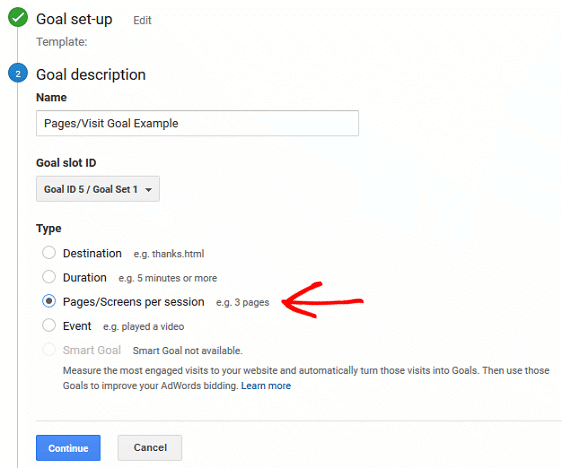 And now, let’s take a look at some Google Analytics goals examples that you might want to use for your own website. Destination goals track when a visitor arrives on a specific page while on your website. This goal type is perfect for tracking how many people land on your thank you pages, order confirmation pages, and add to cart pages. 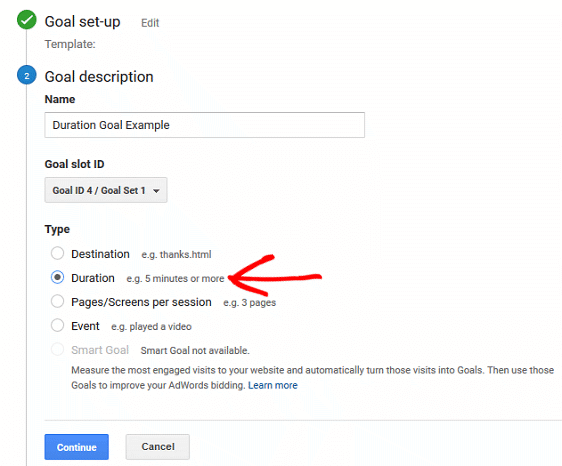 To create a destination goal, click on the Admin tab in your Google Analytics account. From there, click on the Goals section under the View column and click on + New Goal. Select Template and name your goal. Next, click on Destination under Type and click Continue. When it comes to the URL match types Equal to, Begins with, and Regular expressions, make sure to choose the one that best fits your needs. If this is one specific URL that you want to track, choose Equals to. However, if you have created campaign URLs with UTM codes to track specific campaign performances on the page you want to track, select Begins with so that no matter what comes after the URL, if someone lands on that specific web page, Google Analytics will record it as a conversion. Lastly, if you are an advanced analytics user, and you want to define the URL yourself, or match multiple URLs with varying subdomains or UTM parameters, choose Regular expressions. Next, define the URL that you want to track. Only enter what comes after the domain. For example, if you want to track how many people land on your thank you page, and the URL for that looks like this www.example.com/thank-you/, only enter “/thank-you/”. 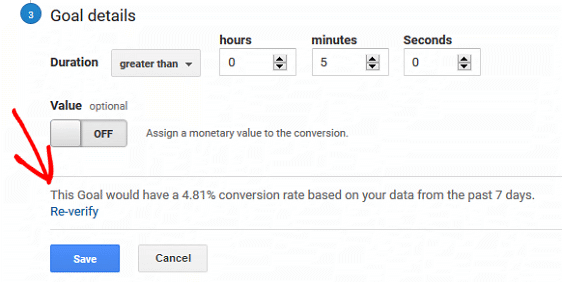 Next, toggle on the Value option if you want to assign a certain monetary value to the conversion. This is helpful if you are tracking eCommerce transactions. Also, if you expect site visitors to follow a certain path after landing on your goal URL, toggle on the Google Analytics goal funnel and define that path. This is good for times you’re looking to guide visitors through a series of web pages to complete a conversion, such as finalize a purchase. Lastly, if you are curious to know how often your goal would have converted based on the past 7 days of Google Analytics data, click on Verify Goal. When you finish, click on Save and Done. And that’s it! 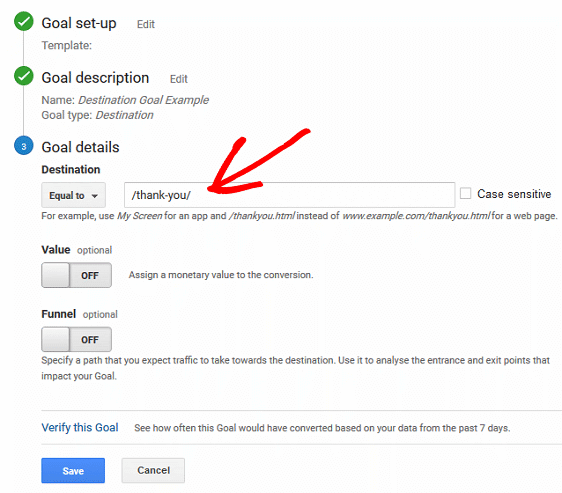 You now have a destination goal set up in Google Analytics. This type of Google Analytics goal is simple. With it, you can track how long site visitors stay on your website before leaving. This is good for tracking user engagement on your site. 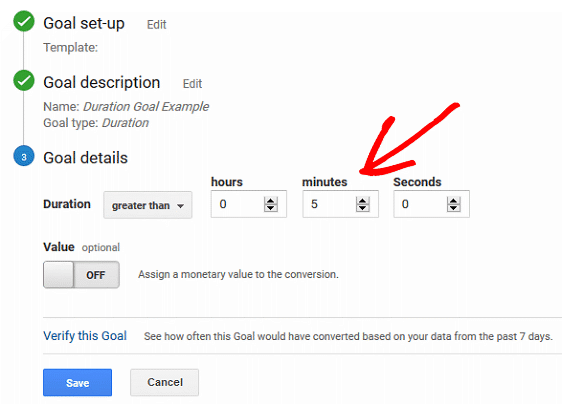 Follow the same steps for creating a goal as mentioned above, though, this time, when you get to the part where you need to pick a goal type, select Duration. When you click on Continue you will be able to define the length of time you want track. For this example, we want to measure how many people stay on our website for more than 5 minutes. Try to pick a duration of time that some people will reach while visiting your website, but not all. If you choose a duration that everyone on your site is likely to hit, such as 1 minute, you will not be able to tell where or how you can make improvements to your site. The same is true if you set the threshold too high and only a few reach it. When ready, click Save and Done and you’re all set. Pages/visit is another easy goal to set up in Google Analytics. Rather than track how much time site visitors spend on your website, this Google Analytics goal tracks the number of pages each site visitor sees before leaving. Again, this is great for measuring site engagement, as well as pinpointing sections of your website that may need improvements. First, select the Pages/screens per session goal type and click Continue. Next, set the number of pages per visit you want to track. In this example, we’ll choose 3. Again, assign a monetary value if you want, and verify the goal to see what kind of conversion rate you can expect in the future. 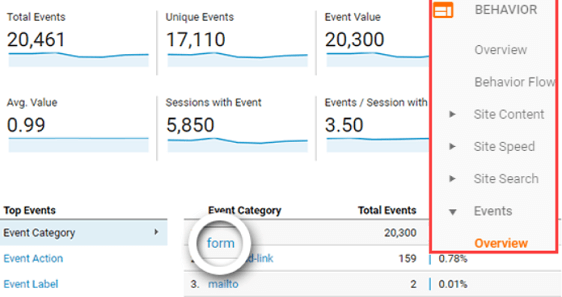 Events are helpful for tracking site visitor interactions on your website that Google Analytics does not normally record. 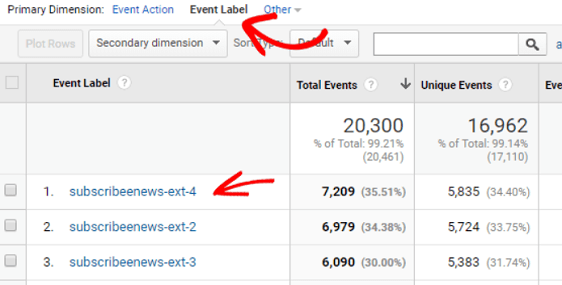 However, by setting up a Google Analytics event, you can begin tracking these types of interactions. That said, if you use the MonsterInsights Forms Addon, there is no reason to deal with form conversions as events or goals. That’s because MonsterInsights tracks form conversions for you. All you have to do is install and activate the addon, no settings or configuration required. The same is true for tracking downloadable material such as PDFs, which are easily tracked with the help of MonsterInsights. 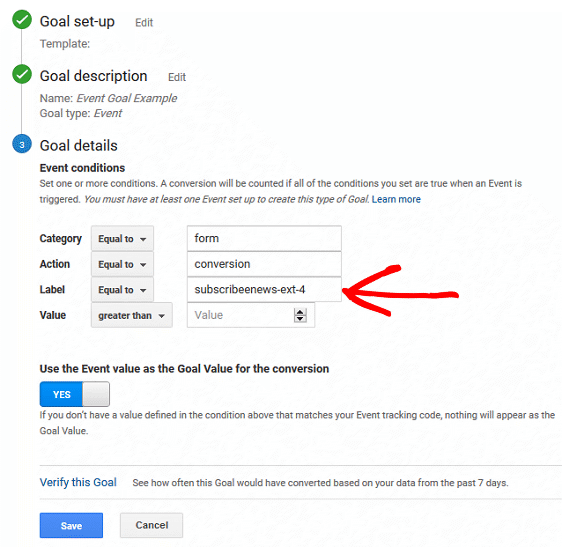 That said, if you do want to create an event goal in Google Analytics, here’s how. Select the Event goal type and click Continue. Next, enter the details of your goal. When using MonsterInsights to track form conversions, the Category and Action will always be labeled as form and conversion respectively. Only the Label field will change when tracking the conversions of different forms on your site. To determine the Event Label, visit the page on your website that has the form you want to track on it. 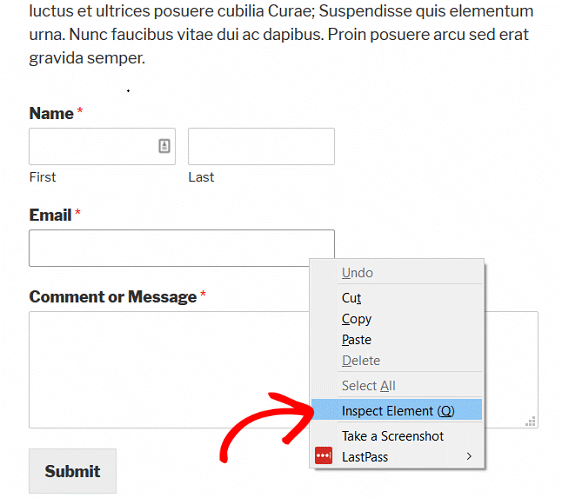 Right click the form itself and select Inspect Element. You can now see the form ID. MonsterInsights uses the form ID as the Event Label in your Google Analytics account. To verify this, go to your Google Analytics account and navigate to Behavior » Events » Overview and click form. Next, choose Event Label as your primary dimension and check to see if your form ID is in the list. If it is, you know you are right and can now enter that into the Label field. Click Save and Done. And that’s all you have to do. 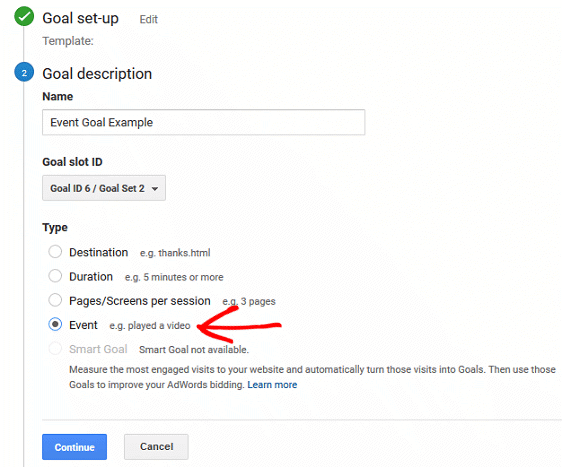 Your event is now set up as a goal in Google Analytics. So, there you have it. 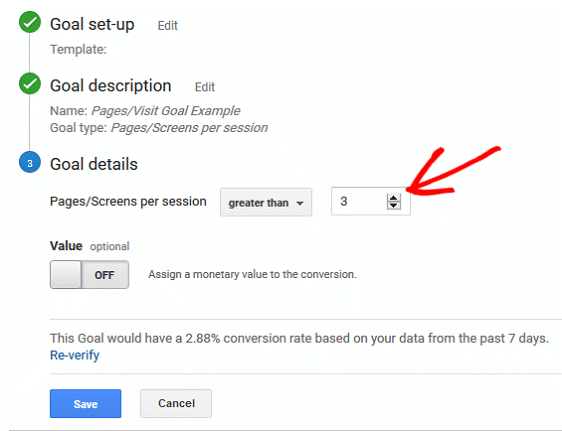 The 4 types of goals in Google Analytics that are critical to helping your business grow. The more interactions on your website that you can track that relate to generating revenue, the better. For more ideas on what to track in Google Analytics as it relates to your eCommerce site, check out our article on key metrics that’ll help you boost revenue.